As members of the Augsburg community we are expected to demonstrate good stewardship in managing the resources in our care. The goal of the Recycling Program is to enlist the entire Augsburg community in the recycling effort. We welcome your suggestions, questions and concerns about the recycling program. For information and to request special pick-ups, please call Custodial Services at x1640. Make recycling a part of your daily activities. With only a little planning, recycling is as easy as not recycling. 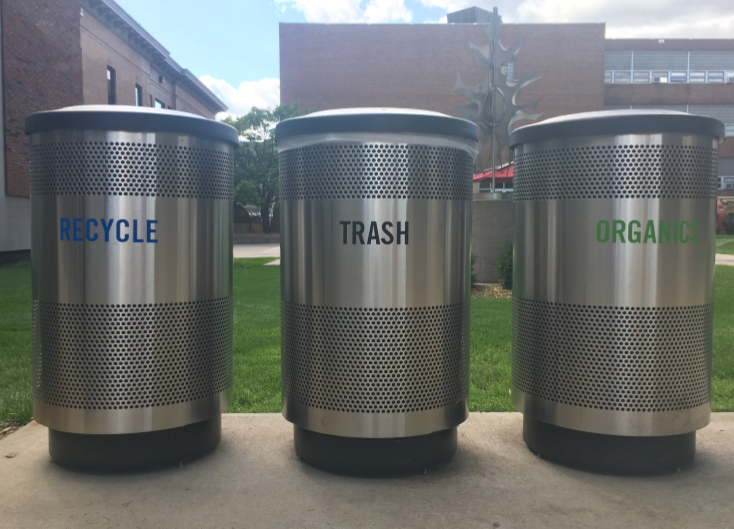 Single-stream recycling containers are located in all buildings on campus, including each dorm room, and outside. 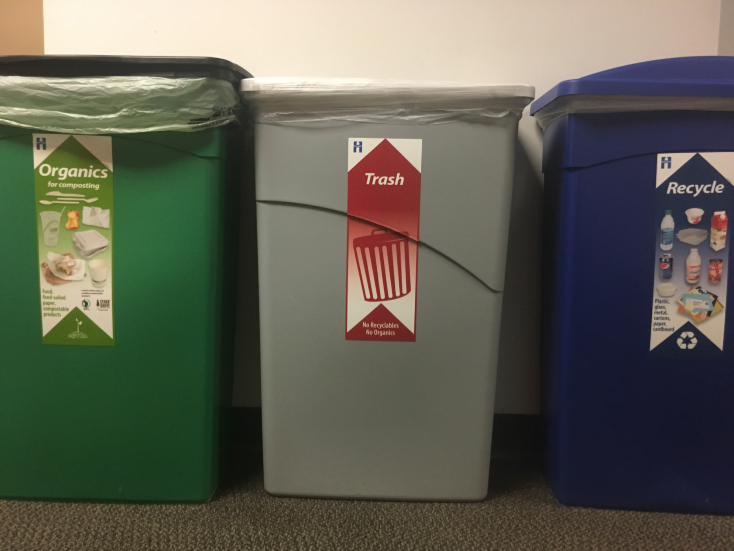 In most buildings, recycling containers are located in central locations in hallways, lobbies and office areas. Notify Custodial Services if you need a special pick-up. For example, you may have large shipping cartons or wish to recycle boxes of old catalogs or brochures. All types of ink jet printer cartridges are recyclable and can be remanufactured. They can be dropped off at places like Target or Best Buy. Feel free to take what you need. Given tight student or office budgets, this can save real money! Facilities Management recycles old appliances, carpeting, auto batteries and some scrap metal. Yard waste (i.e., grass clippings, leaves, branches) is kept in a separate dumpster for composting. We have had tremendous success in recycling Augsburg’s cast-off furniture. Schools, shelters, and other charitable organizations have benefited from these reusable items. IT recycles its old computers through a service that extracts the metals, after salvaging parts. Burned out fluorescent light bulbs are taken to a special disposal site that extracts the mercury; hazardous waste that otherwise would end up in landfills and possibly in ground water. In the past those same fluorescent lights used ballasts containing PCBs. Such ballasts are also kept out of the waste stream and processed to render them less harmful to the environment. Disposal of hazardous chemicals, bio-hazardous waste, and lab sharps (syringes, glass slides, etc.). Even though the task of managing waste is complex, there are definite benefits to the environment and to the Augsburg community. The essential point of waste prevention is to reduce the amount of waste we generate in the first place. Waste prevention conserves natural resources, raw materials, and land otherwise needed for landfills. Waste prevention is also its own direct economic reward. Here are just a few of the simple things you can do to help. Please send us your tips so that we can pass them along to others. Make two-sided copies. This saves money as well as paper. Reuse the blank side of office paper for jotting notes. Avoid printing on dark or brightly colored papers. Reuse envelopes for sending on-campus mail or use multiple-name routing envelopes. Use your own ceramic coffee cup instead of Styrofoam. Share newspaper and magazine subscriptions with friends and colleagues. Send correspondence through e-mail: avoid “snail-mail”. Purchase quality goods; they will last longer and be more economical in the long run. Offer to give away what you no longer need; one person’s trash may be another’s treasure. Close the recycling loop by purchasing products made from recycled materials.